Grace is a 1 year old American Pit Bull Terrier mix who was transferred into our shelter from a nearby and overcrowded shelter. 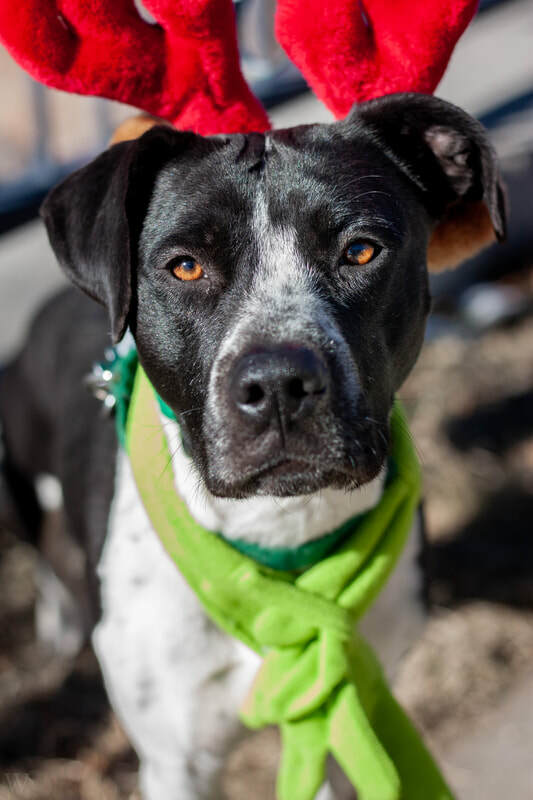 Grace gets along great with other dogs, is in a play group with some, has a kennel pair inside the shelter, and we think she would be great in a multi-dog home. She can be a little shy at first, which we are working on, and has already made amazing improvements. Grace is working on learning her basic commands, perfecting her leash work, and being comfortable in a busy building ( like the shelter thrift store) . Once we feel she has mastered all of these things, we will run her through the Canine Good Citizen test. She has gotten very good at 'touch' which is a command we are using to help her gain confidence, as well as distract her from any situations she becomes uncomfortable in. We are continuing to work with Grace on building confidence, as well as expanding her ability to do other commands in busy areas. 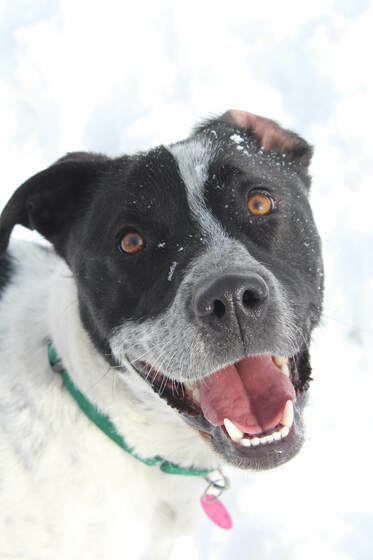 Grace would love to go into an active home where she can run around, hike, play in the snow, and go for lots of walks. This lovely lady has been spayed, micro-chipped, and is up to date on vaccinations for $99. Grace has been at the shelter since 11/29/18. Grace has been adopted! Butters is a 1 year old American Pit Bull Terrier/ Mix. We can't guarantee what breeds make up this boy, but we can say he has the amazing attributes of so many! Butters came in as a surrender when it became apparent he did not get along with livestock, and will need to be adopted into a livestock -free home and environment. Butters comes on as a confident and strong boy, but he is a little less comfortable then he lets on in new situations. He has been spending lots of time with our trainer to help him gain confidence in situations new to him, as well as work on his dog reactivity. Butters has made amazing progress since coming to the shelter, and now plays with a group of other dogs, something he was not able to do when he first came in. We think Butters will do fine in a house with a strong cat (one who will smack before running) as he was terrified of a cat when he recently encountered one. As in, tried to run away from the cat. Butters is a very sweet boy who is looking to go into a dog experienced and confident home, where he will be able to bond with someone and thrive into the fantastic dog we know he can be. He is neutered, micro-chipped, and up to date on his vaccinations for $99. 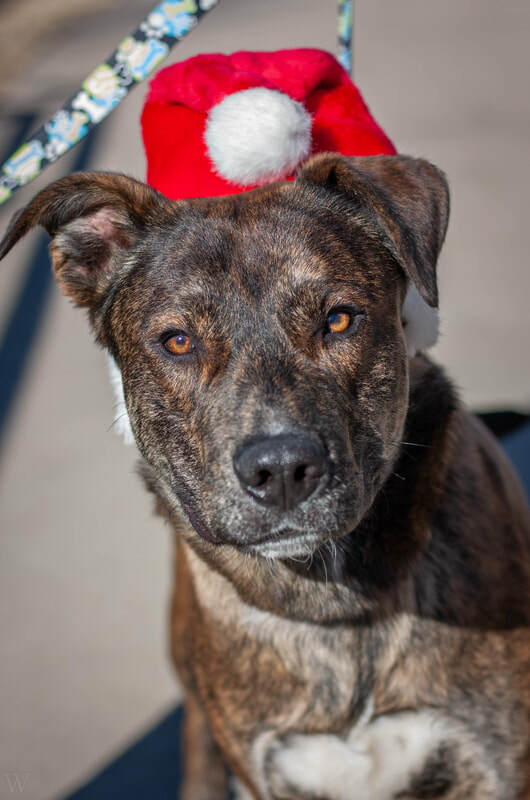 Butters has been at the shelter since 11/14/18. Butters has been adopted! 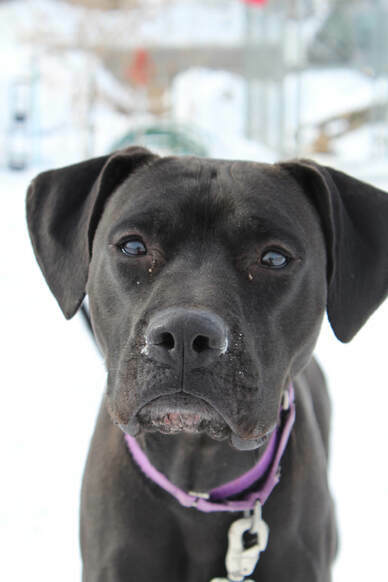 Onyx is a 2 year old American Pit Bull Terrier/ Retriever mix. He was found as a stray and no one came to claim him. Onyx is a little shy at first, so we are working on confidence building with him, but he is a total love once he is comfortable with you. Onyx gets along well with other dogs, and would do well in a home either with or without other dogs. Because he can be pretty nervous at first, we are recommending no younger kids, as we don't want to scare him and have him take steps backwards and become more shy. Onyx would do best in a calmer and patient home, and needs someone who is willing to work with him a little bit on confidence building, as well as help him learn some basic behaviors. This sweet boy can be a cuddle bug once he warms up, and is one of our move favorite guys right now! He has been neutered, micro-chipped, and up to date on his vaccinations for $99. Onyx has been at the shelter since 12/31/18. Onyx has been adopted! Pinky is a 1 1/2 year old Cattle Dog/ American Pit Bull Terrier mix. She was brought to the shelter as a stray and no one came to claim her. This fantastic girl is very energetic and loves to run around outside. Pinky is great at playing fetch! She brings the ball back, drops it at your feet, and goes and chases it again! Pinky is very new to the shelter, and we have not yet seen her full personality. Pinky has done well with playing with other dogs, and we think she would do okay in a home with or without other dogs. This sweet and confident girl is looking for a like-minded owner, and we can't wait to see her grow once she has been adopted! Pinky is already spayed, micro-chipped, and up to date on her vaccinations. Pinky has been at the shelter since 12/31/18. This fantastic girl found her forever home!